The name of this waterfall translates into Flying Water. It’s a ‘horsetail waterfall’ in that The weight of the water is the same at the top as it is at the bottom and the flow does not really ever move away from the Rocks down which it is falling. You can bathe in the pool here, and the waterfall is only about thirty meters high, which means you can stand under the torrent and not to be overwhelmed by the volume. The scenery is classic Bali- rock draped with lush tropical forests. The falls only really become crowded on Galungan Day, which is a sort of local festival. That’s not a bad thing; the atmosphere during the festival is really fun. It’s possible to climb up to the top of the waterfall if you’re wearing sturdy shoes. Technically the waterfall is free to visit, but the village asks for the donation of about Rp 2500 at the entrance. Drive to Leh Village, park near the entrance, then walk to the river, cross it, and follow the path to the waterfall. How popular is Les Waterfall? People normally club together Setia Darma House Of Mask And Puppets and Mount Batur while planning their visit to Les Waterfall. Lovely short trek through the jungle leads to one of Bali’s highest waterfalls. If you’re lucky you’ll see some monkeys! Note the office will tell you that you need a guided (~150k per person), this is why four stars, you don’t and can walk yourself for ~40k! The Les waterfall has unique combination of beautiful scenery, pristinely clean water and almost no tourists. It is about 15 minutes walk in natural track from parking lot. Stayed in a hut in the jungle over one night, one of the best experiences of my life. 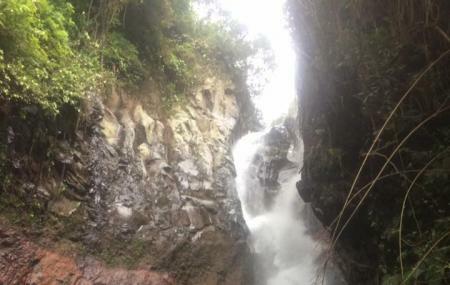 Wake up early and take a shower under the waterfall, loved it and strongly recommend this place.